State fisheries and wildlife agencies need a consistent aquatic habitat classification system to build current digital habitat maps to effectively implement State Wildlife Action Plans that help protect wildlife and their habitats. In response to this growing need, the Northeast Aquatic Habitat Classification System (NEAHCS) was developed with financial support from the Doris Duke Charitable Foundation through the National Fish and Wildlife Foundation. Each of the 14 Northeast jurisdictions (including D.C.) participated and contributed in-kind support. Information on the sister project - the Terrestrial Wildlife Habitat Classification System - can be found here. Together, the Aquatic and Terrestrial Classification Systems and Aquatic Spatial Data and Terrestrial Spatial Data greatly enhance state and regional conservation among the northeastern states. 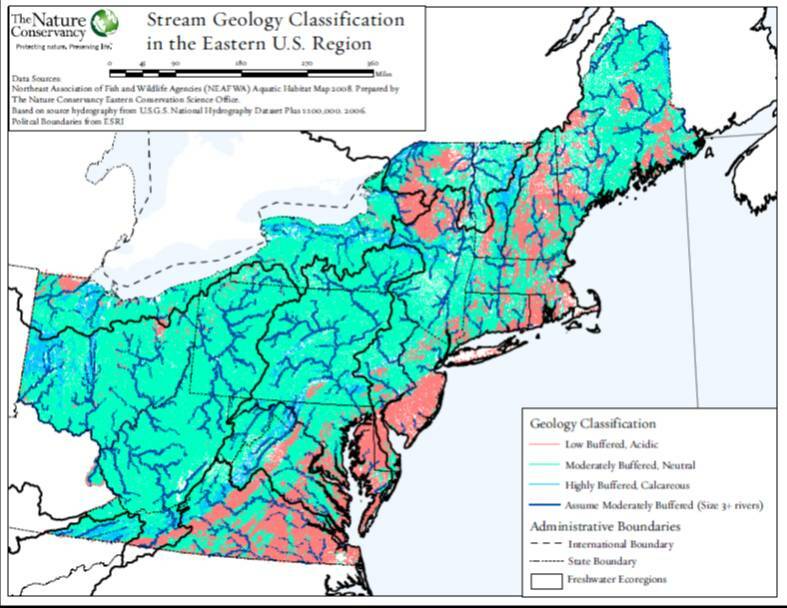 The Northeast Aquatic Habitat Classification System (NEAHCS) developed a standard classification system and GIS dataset to describe and map stream systems across the northeast. The classification and GIS dataset consistently represents the natural flowing-water aquatic habitat types across this region in a manner deemed appropriate and useful for conservation planning by the participating states. The system is meant to unify state classifications and promote an understanding of aquatic biodiversity patterns across the region. It is not intended to override local stream classifications but rather to put them into a broader context. The classification is based on the approach developed by the Nature Conservancy and recommended by the National Fish Habitat Science Panel (Higgins et al. 2005; Beard and Whalen 2006). This approach can be implemented across regional scales using GIS modeled variables and it emphasizes differences in stream size, slope, elevation, climate, and geology which shape aquatic ecosystems at several spatial scales and influence the physical aquatic habitat template (Higgins et al. 2005). The NE Aquatic Habitat Classification System files folder can be downloaded below and contains the NEAHCS Final Report, Excel Appendices, and Maps. The GIS dataset of basic aquatic habitat using the NEAHCS (produced in ArcGIS 9.2) can be downloaded by complete region or by individual northeastern states (below). For more information on the project and to explore the latest additions to the map, please visit The Nature Conservancy's Conservation Gateway. Name: Mark G. Anderson, Ph.D.